Volcan Lanzarote Hotel Free Child Places Playa Blanca, Lanzarote Low Deposit Family Holidays @Web2travelDeals. Online Since 2000. The 5 star Volcan Lanzarote Hotel is designed in the style of a Canarian village and provides a series of small buildings. There are 5 swimming pools, infants pool, a couple of restaurants, pool bar, spa, lovely grounds and excellent large rooms with comfy beds. The food is excellent quality and a good range of options at breakfast and dinner. The hotel is located directly on the seafront in front of the yacht harbour, next to the Rubicon Marina where you will find shops, cafes and restaurants just a few minutes away. There’s a lovely walk along the coast line in either direction. This accommodation has previously been known as Gran Melia Volcan Hotel. Also called THe Volcan Lanzarote by some Tour Operators. 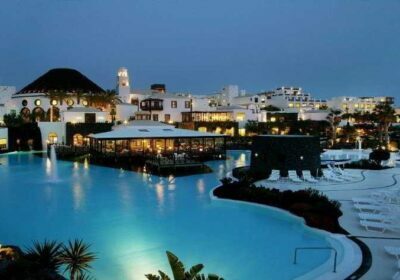 Claim your Free Child Place Now for Volcan Lanzarote Hotel Playa Blanca. The hotel is located on Lanzarote’s south coast near several beaches and the resort of Playa Blanca. The hotel’s 251 rooms can be found within 20 village-esc houses across the complex. Room types comprise of the Double Room (with garden or sea view), the Suite and the Junior Suite. All rooms are equipped with large and comfortable beds, a telephone, Wi-Fi, TV, minibar, safety deposit box, tea/coffee making facilities, air conditioning, ceiling fan, bathroom with bathtub, hairdryer and balcony or terrace. Suites are more spacious and benefit from a whirlpool bath. Volcan Lanzarote Hotel also has 48 rooms just for adults, offering luxury and privacy for the ultimate romantic getaway. The Volcan Lanzarote offers five swimming pools, including one children’s pool, plus a spa centre and gym. The spa offers beauty and massage treatments, a sauna, Jacuzzi, Turkish bath and hair salon; all at an extra charge. Sports facilities include tennis and squash courts, a pool table, darts, archery and an external diving centre. Entertainment ranges from a mini club and disco for the kids to live music for the adults. There is also the Adult Only area Club Volcan offering exclusive treatments and services. Moreover, from the hotel you can directly access Marina Rubicón, which offers ample shopping and leisure options. A range of restaurants and bars can be found on-site, including two buffet restaurants and a la carte dining venues serving local Canarian, Italian and Japanese cuisine. The bars on-site include the lobby bar and Fun Pub. Prefer Flight Plus Hotel Deals?